In the presence of Brazil’s defence minister, President David Granger today signalled a desire for stronger defence cooperation with Brasilia in light of what he said was the “present situation in the northern coast of South America”, an apparent reference to the situation in Venezuela. The President also lauded Brazil for its support on the question of the border controversy with Venezuela. Brazil’s Defence Minister Raul Jungmann was conferred with the Cacique Crown of Honour during the visit today. 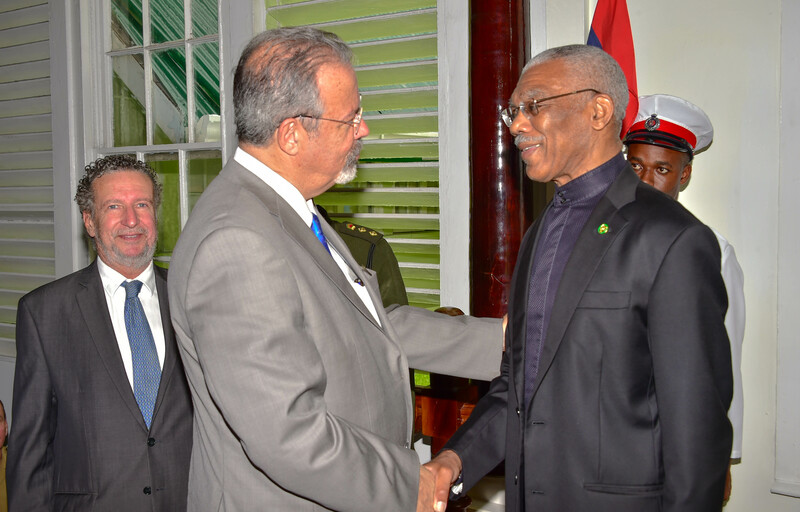 President David Granger, joined by some Ministers of Government and members of the Defence Board, today, hosted Brazil’s Minister of Defence, Mr. Raul Jungmann Pinto, along with a high level delegation, which included Brazil’s Minister of Justice, Mr. Torquato Lorena Jardim. 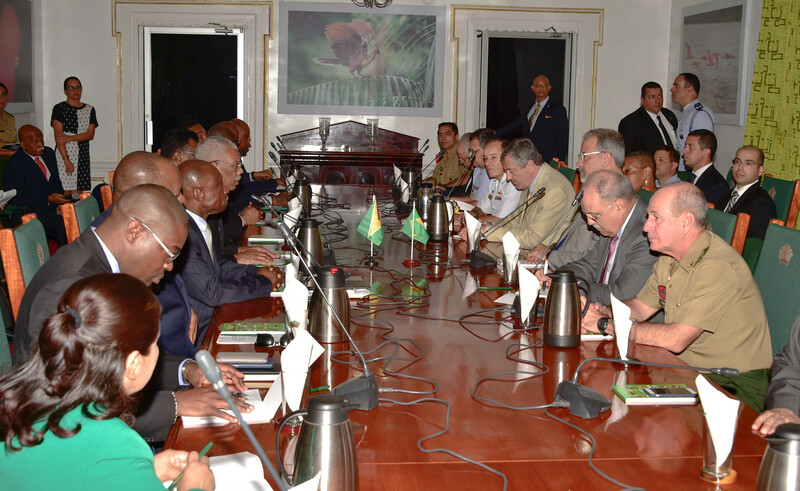 The bilateral engagement, which was hosted at State House, saw a commitment by both countries to review the September, 2012 Joint Communiqué, which followed the official visit to Guyana by Ambassador Celso Amorim, then Minister of Defence of Brazil. The review is intended to update the agreements in that document and bring them in line with present-day realities, as well as, to deepen defence cooperation. The President’s team included Minister of Foreign Affairs, Mr. Carl Greenidge, Minister of State, Mr. Joseph Harmon, Minister of Public Security, Mr. Khemraj Ramjattan, Attorney General, Mr. Basil Williams, Minister of Public Infrastructure, Mr. David Patterson, Minister of Natural Resources, Mr. Raphael Trotman, Minister of Citizenship, Mr. Winston Felix, Minister of Finance, Mr. Winston Jordan and Minister of Public Affairs, Ms. Dawn Hastings-Williams. Officials from the visiting delegation included General of the Brazilian Army, Mr. Sergio Etchegoyen, General of the Brazilian Army, Mr. Fernando Azevedo E. Silva and a representative from the Brazilian Foreign Affairs Ministry, Ambassador Nelson Tabajara De Oliveira. President Granger said that this visit, which follows closely after his own official State visit to Brazil in late December, is the initiation of the celebration of 50 years of diplomatic relations between Guyana and Brazil. He added that the signing of that 2012 Communiqué saw the establishment of a bilateral defence working group. 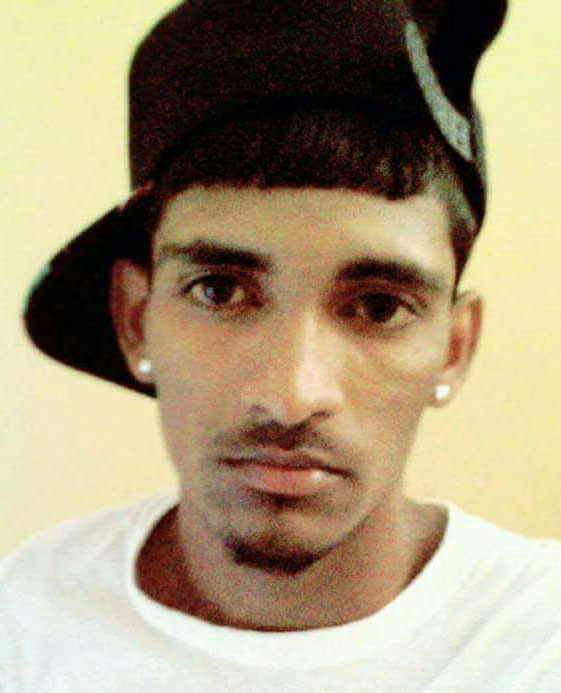 “We would like to review the Joint Communiqué to determine its applicability to present-day circumstances. That agreement contained seven points, which are being implemented but in light of the present situation in the northern coast of South America we would like to review that agreement… to put greater emphasis on surveillance and our involvement in the Amazon Surveillance System,” President Granger said. To this end, Minister Jungmann informed that Brazil is ready to revisit the terms and provisions of the Communiqué to work out the modalities of how the two countries can cooperate in the areas of defence outlined by the President. “We are willing to review the Communiqué. We will do this through our Military Attaché… who will then refer it to the higher authorities,” he said. Speaking of defence cooperation, Minister Jungmann told the President that countries in the hemisphere have to work more closely together to tackle problems like drug-trafficking and other transnational crimes, which threaten law and order and citizens’ safety. 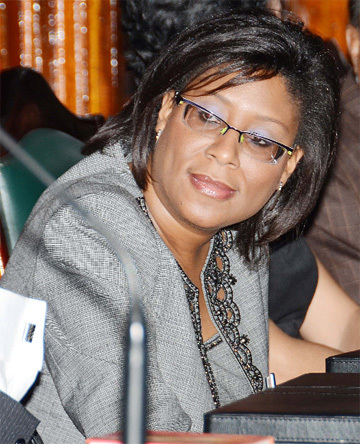 “As Minister of Defence, we have responsibility for the army, the marine and the air force, so whatever we can do to assist Guyana, let us know,” the Minister told the President. 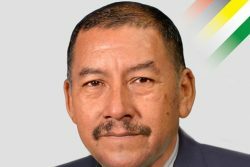 Meanwhile, Guyana’s Minister of Foreign Affairs Minister updated the visiting delegation on the recent developments of the Guyana-Venezuela border controversy, which he said is at the heart of Guyana’s national security. President Granger also took the opportunity to place on record, Guyana’s gratitude to Brazil for its support for Guyana in the border controversy with Venezuela. “Brazil, for 50 years, has been a guarantor of our territory and has maintained that it is not interested in in any changes to settled boundaries,” he said. Minister Jungmann said that Brazil has the third largest border in South America and the world at large and it has frontier with 10 countries. He noted that Brazil wants to see the controversy with Venezuela resolved permanently and in a diplomatic manner, which can be achieved at the International Court of Justice (ICJ). This, he said, is vital for the stability of the South American continent. This visit follows a State Visit to Brazil by President Granger in December last year during which discussions were held on cooperation between the Guyana Defence Force and the Brazilian Military in terms of capacity-building and expertise transfer and follow-up dialogue on the work of the Guyana-Brazil Joint Technical Working Group, which was established to identify and implement key developmental projects. 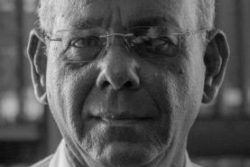 Additionally, last month, Brazil’s Minister of Health, Dr. Ricardo Jose Magalhᾱes Barros visited Guyana to explore possible areas of cooperation in the health sector.